Freely written name and address with Y&C Gel Xtreme GX100G pen, which is finally running out after about 120 addresses. I took these envelopes and a gel pen along with me on my trip to Florida recently, doing most of the work on the airplanes. The pen is just about out of ink now, but I eked this one out at the end. I had misspelled the name Rachel and so converted this one to a sample. After all these years, I’ve got lots of “samples” in my studio. It’s been so hot that I’ve been working in the dining room on the main floor of the house. My studio over the garage is an oven this summer, especially in the afternoons. 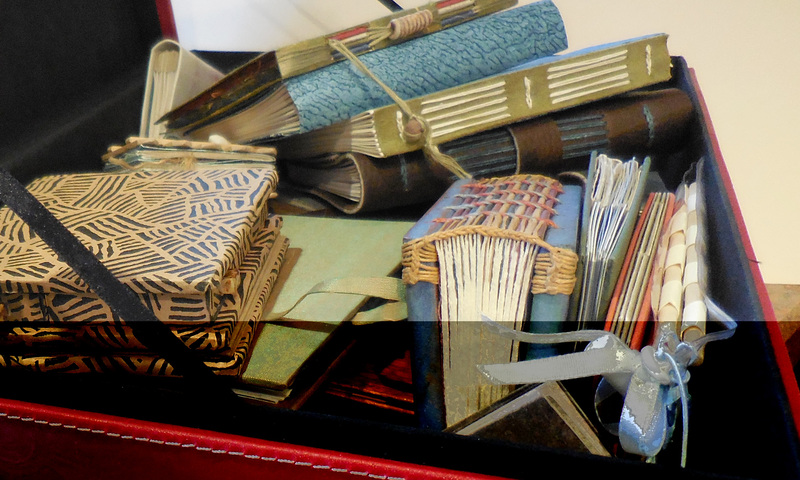 For the past couple of days I’ve been addressing wedding invitations, which is good from a “venue” standpoint: the tools and materials needed are finite and portable. Pointed pen is so different from broad-edge pen lettering, that when I switch from one to the other that I must practice to get back in the groove. Shown above are two of the three pages done to prepare for job. For the first page (not shown) I lettered in my default pointed pen script. Because the invitation was printed in Bickham Script, on these two pages I developed a script style that incorporates some of the characteristics of Bickham. I’m always aiming for a balance between contrasting and complementing the printed invitations. Too little contrast, and it looks like inept printing. 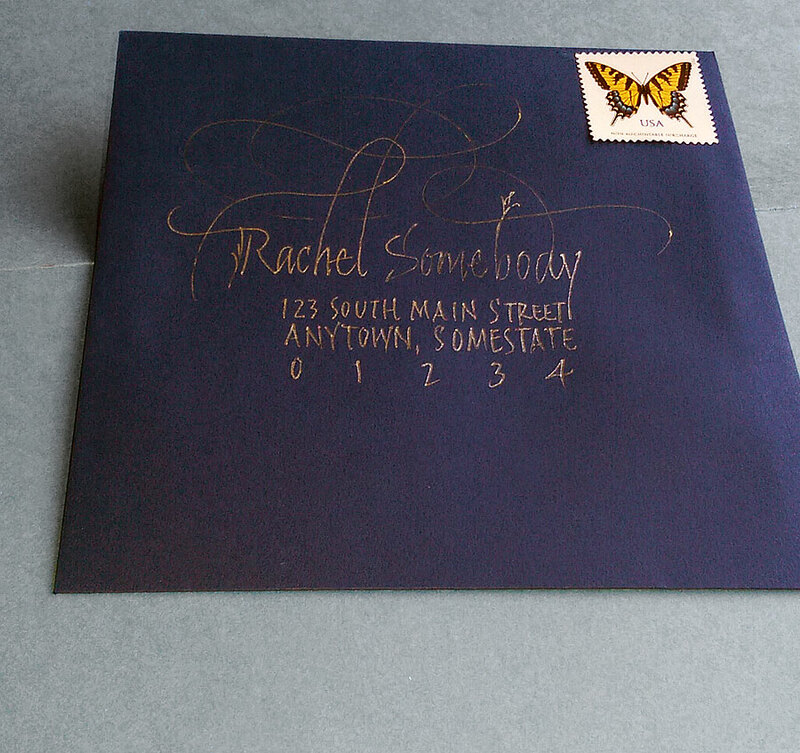 Too much contrast, and there is no connection between the addressed envelope and what’s inside. 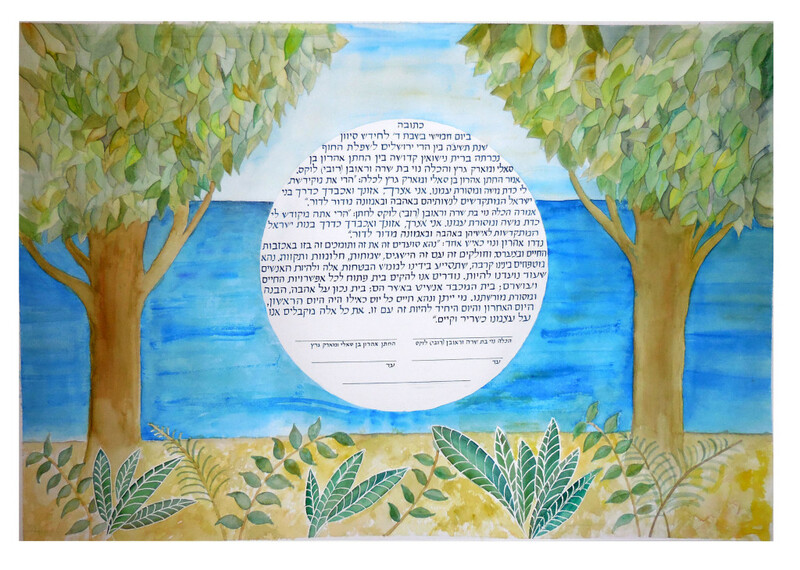 I had the honor of making this ketubah for Aaron and his bride Noy. An honor and a pleasure, as I’ve known Aaron since about the time he entered kindergarten. It was a beautiful evening in the foothills of the Judean Mountains.